No time to roll sushi or make radish roses at 6am? Try these real-life quick and easy school lunch ideas instead. Can you believe it’s already time to think about going “back to school?” While you’re busy buying new shoes and finishing those summer homework packets, it’s easy to lose sight of one of the most important (and most stressful) parts of the school year routine. Coming up with healthy school lunchbox ideas every day of the week is enough to drive you crazy. You don’t want your kids filling up on the pizza and fries served at the school cafeteria, so you’ve committed to packing nutritious lunches for them yourself. But while you don’t want to fall into the boring routine of sandwich-chips-fruit every day, you’re also not about to start packing hand-rolled sushi for your 3rd grader. Quick & Easy: If you’re awake enough at 6am to make an Angry Birds bento box, we salute you. For the rest of us though, healthy school lunch packing needs to be pretty user-friendly. Try incorporating leftovers from last night’s dinner, and using simple cookie cutters and napkin-notes for a personalized touch. Choose your battles: According to a study by Harvard, school students throw away over $1.2 billion worth of food each year. That’s a lot of waste. If you know your child probably won’t eat the carrots you’re packing, don’t pack them. 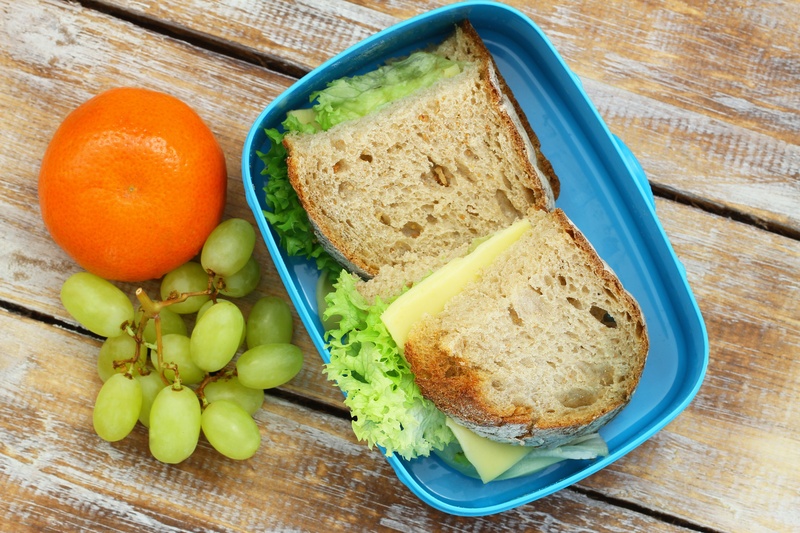 Pack healthy school lunches you know they will enjoy, and save the dreaded veggie battle for dinnertime, when you can make sure they make it into your kid’s tummy, not the trash. Be Aware of Allergies: Many schools are going “nut free” for allergy reasons, so be sure to know the rules before packing your child’s lunches. Sometimes nothing hits the spot like a good old PB&J, but if you had to eat them for lunch everyday, you’d get tired of them pretty quickly. So will your kids! Forget the sandwiches and try these three creative school lunch ideas. The Roll-Up: Skip the bread and make tasty roll-ups instead. Simply layer meat, cheese, and other desired toppings like condiments or thinly sliced veggies and roll them up. Pack as-is or slice into pinwheels. Also try using sandwich wraps and pita pockets instead of traditional sandwich bread. The Stacker: Like the Lunchables your kids probably beg for at the grocery store, only better, these are one of the simplest healthy school lunch ideas for kids ever. Just toss meat, cheese, crackers and other toppings into a bento-style box and let kids make their own lunchables! The Nibbler: A great way to use up leftovers, nibble plates can use up bits and pieces to form a nutritious school lunch. “Dipping” plates using hummus, salsa, or guacamole are also fun. With these school lunch bag ideas up your sleeve, you can relax a little and get back to all those summer reading list books! For more ideas on incorporating more healthy foods into your busy lifestyle, check out some of the other blog posts at Wellworks For You.